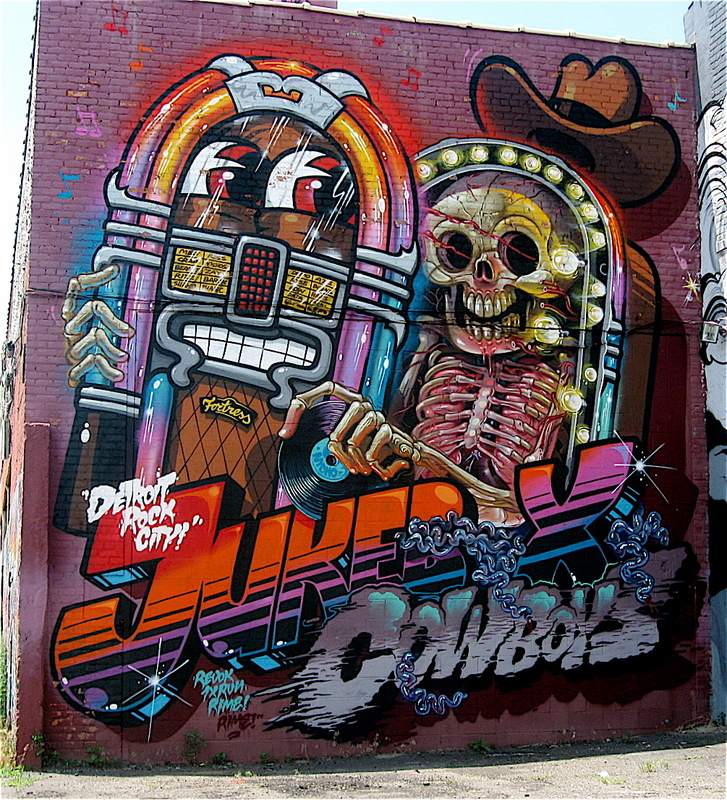 In last week’s entry I highlighted some of the large, colorful graffiti murals that can be found in the city of Detroit. 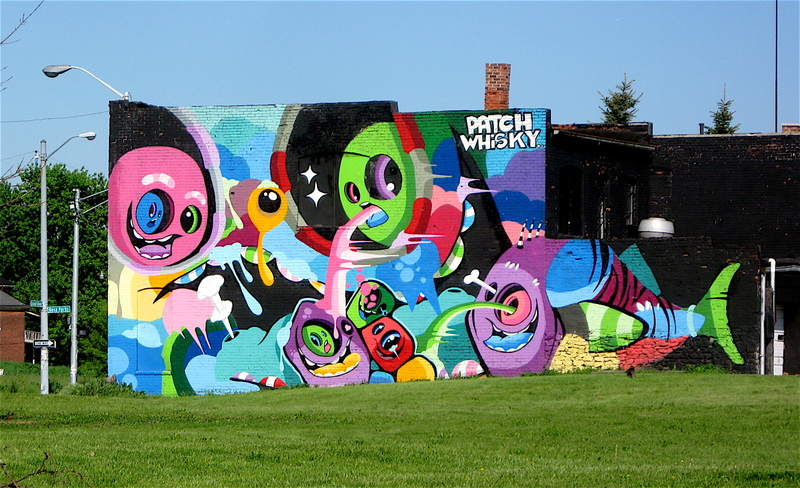 Many of the huge, multi-colored pieces I’ve seen (and presented in that blog entry) have extraordinary detail considering they are created from nothing more than the nozzle of a spray can. 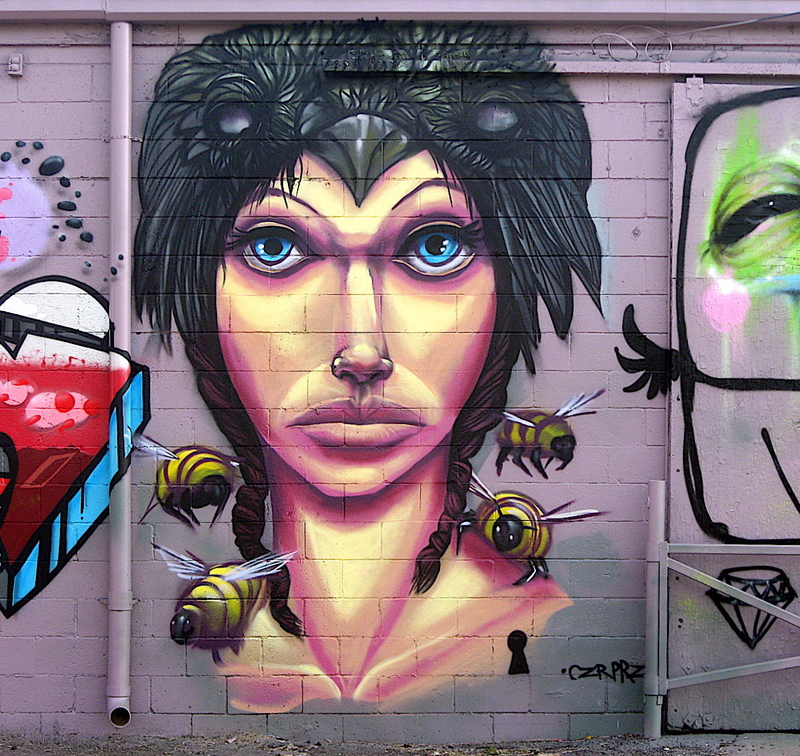 A number of the pieces I highlighted have graced the walls of outdoor galleries for years, while others have been added to walls within the last month or so. 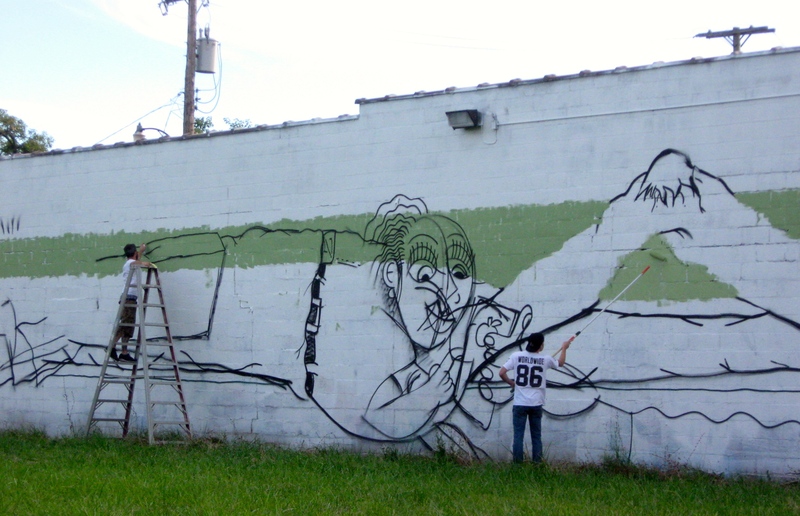 Lately, there seems to be a plenty of new murals being created on the sides of buildings and elsewhere. 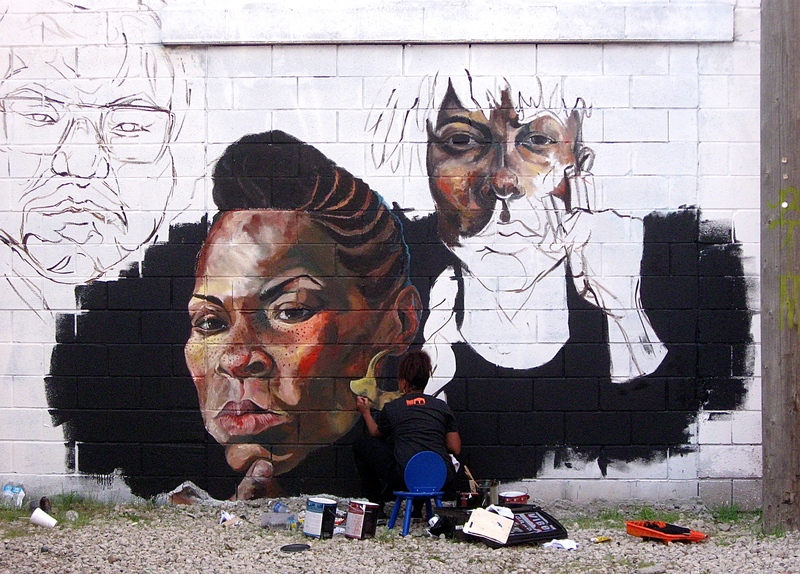 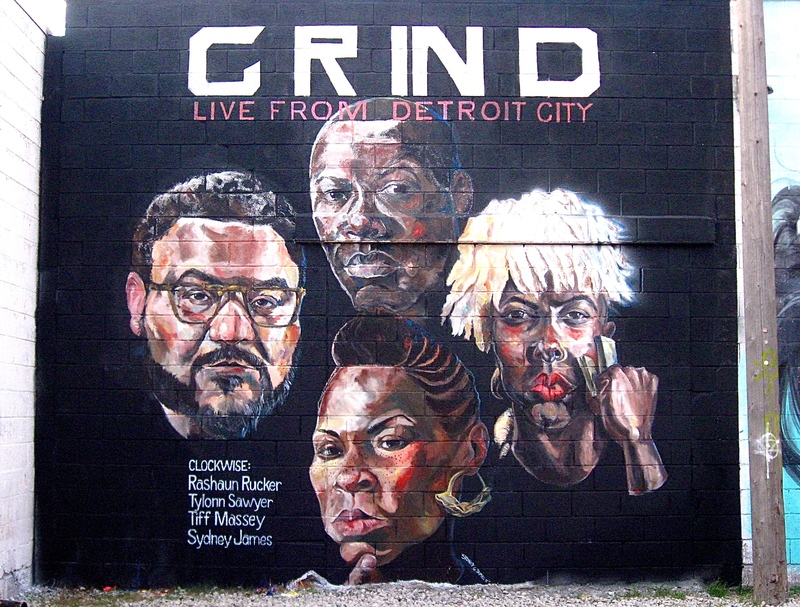 Although most are designed and created by talented Detroit artists, it isn’t unusual to spot a piece by a painter from Los Angeles, New York or elsewhere. 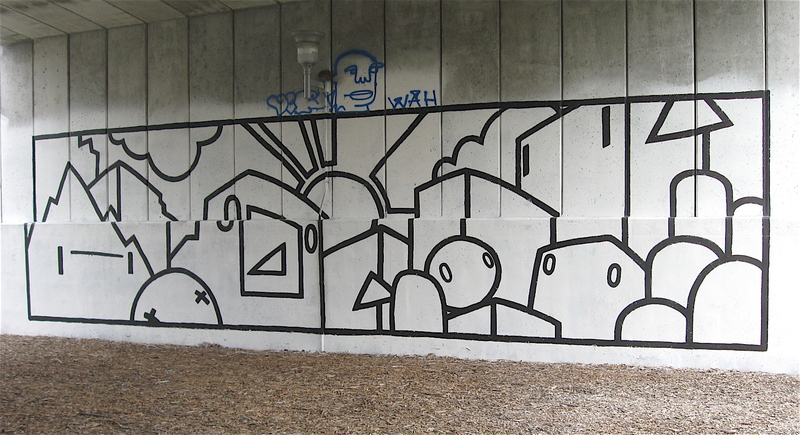 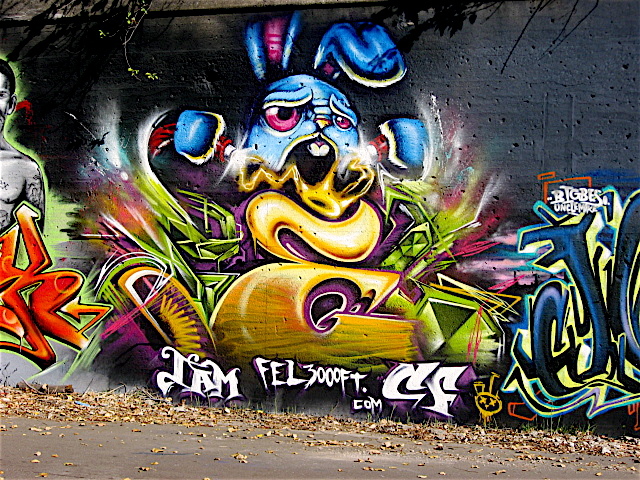 This is the second in an occasional blog entry on the city’s imaginative graffiti murals. 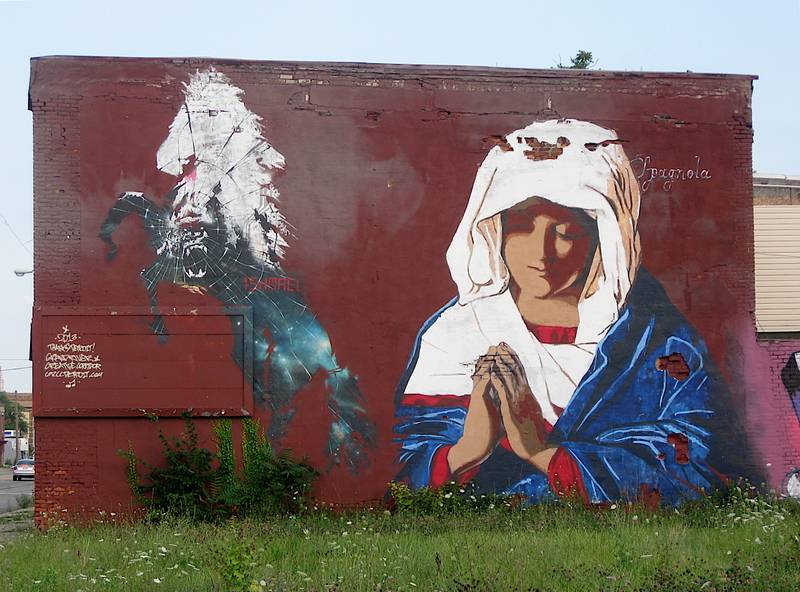 Since the works can vanish overnight, or change and evolve rapidly into something completely different, I hope to roll out more entries featuring the interesting street art I see on my bicycle travels across the city. 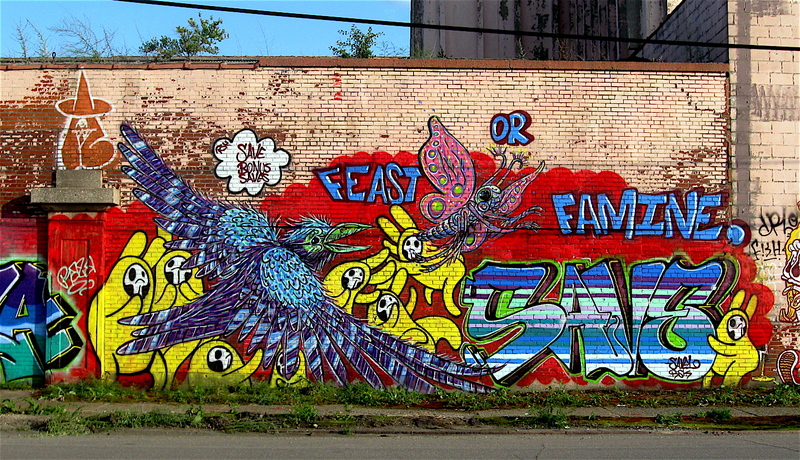 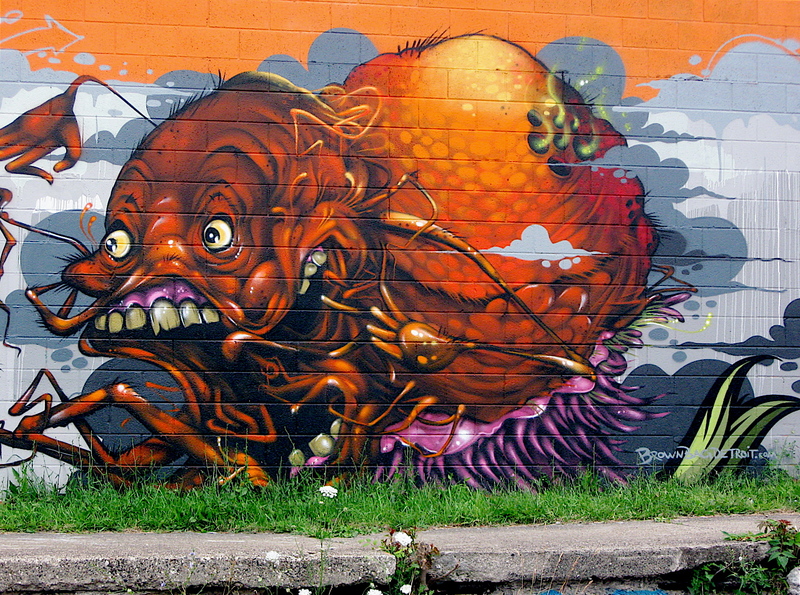 In the meantime, keep your eyes open because you’ll never know what you’ll see on a wall in Detroit. 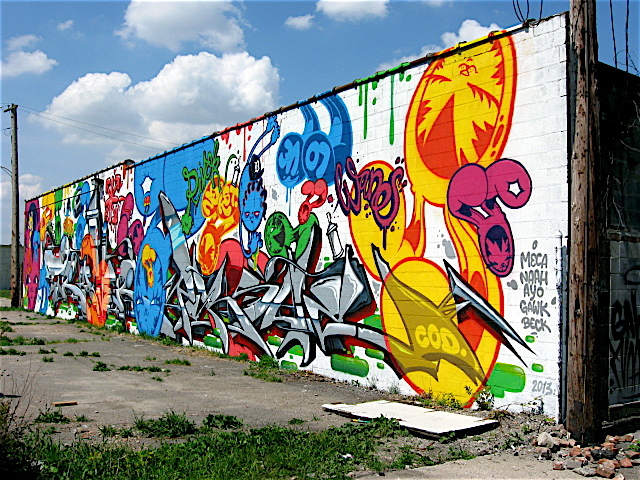 Graffiti isn’t all one or two-color tags, quick hitting initials or large hard to read letters sprayed on the sides of buildings from fire extinguishers. 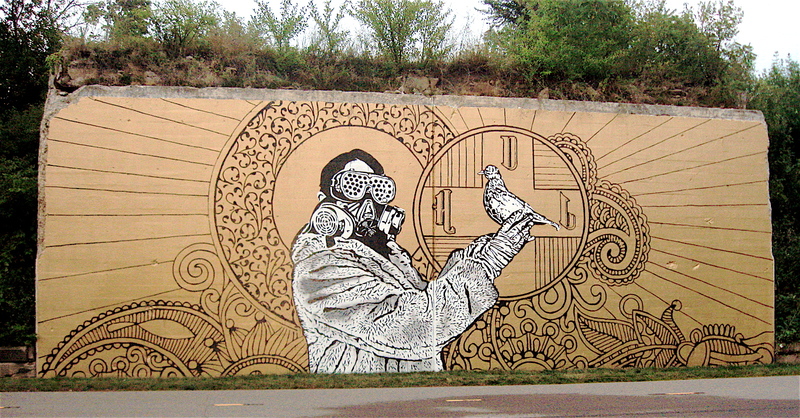 There is much more to it than that. 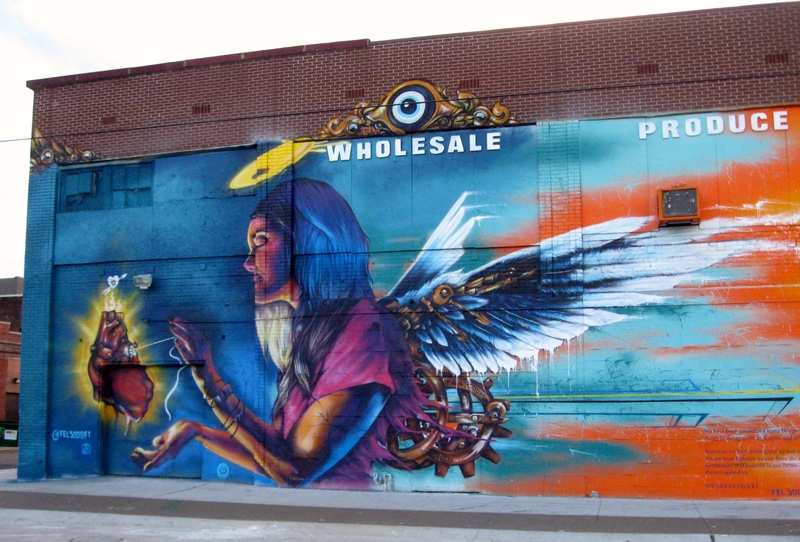 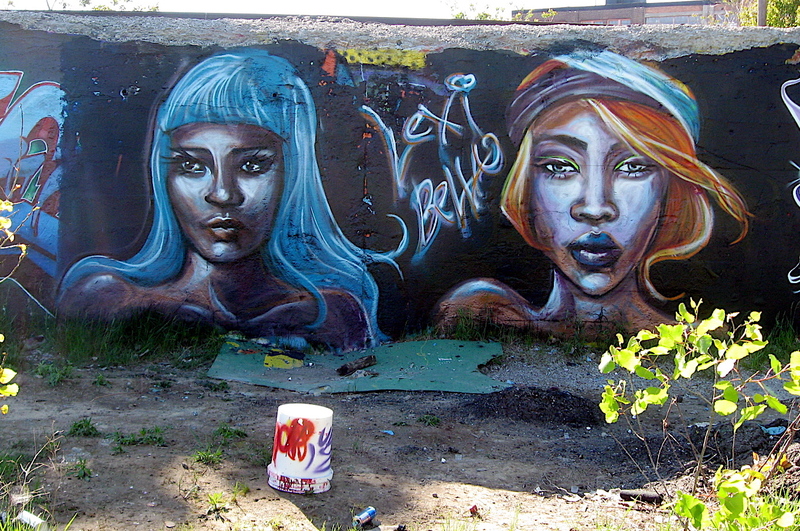 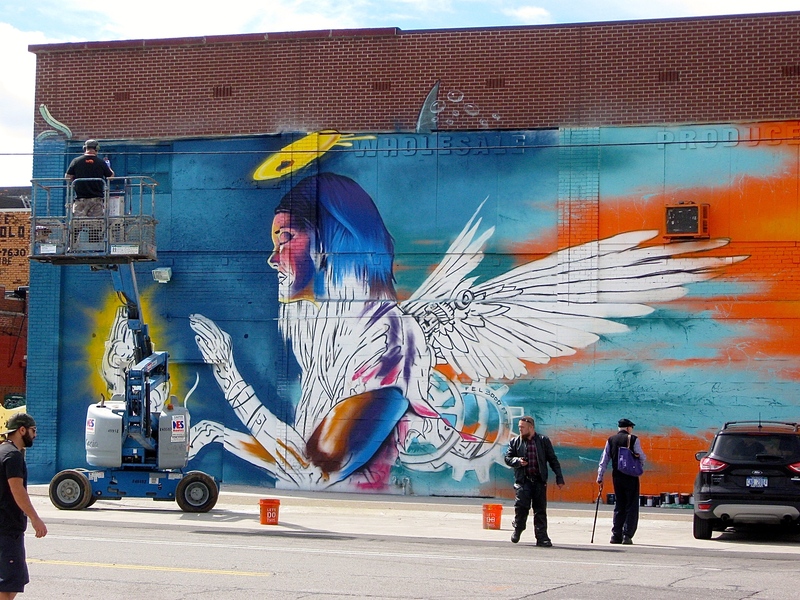 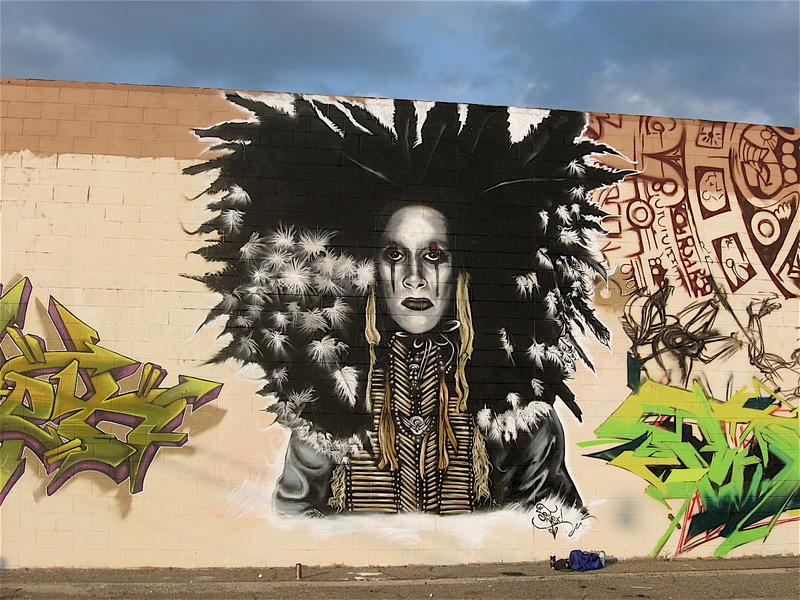 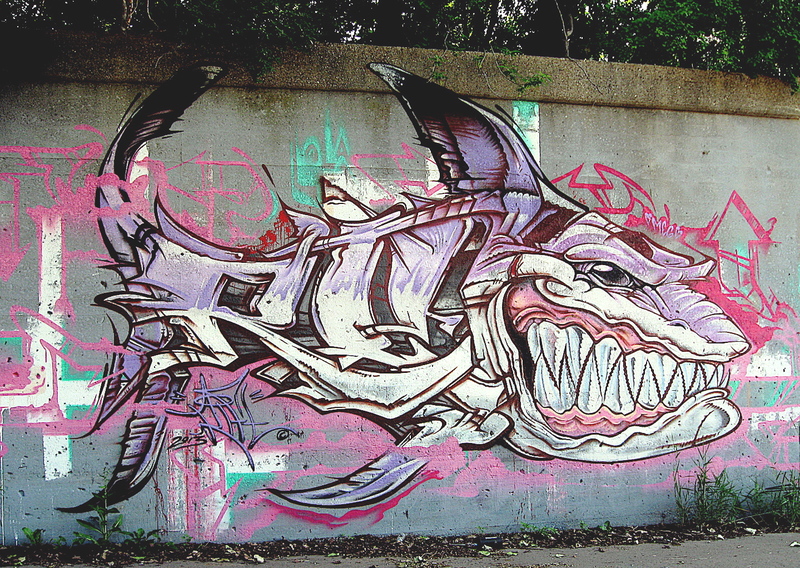 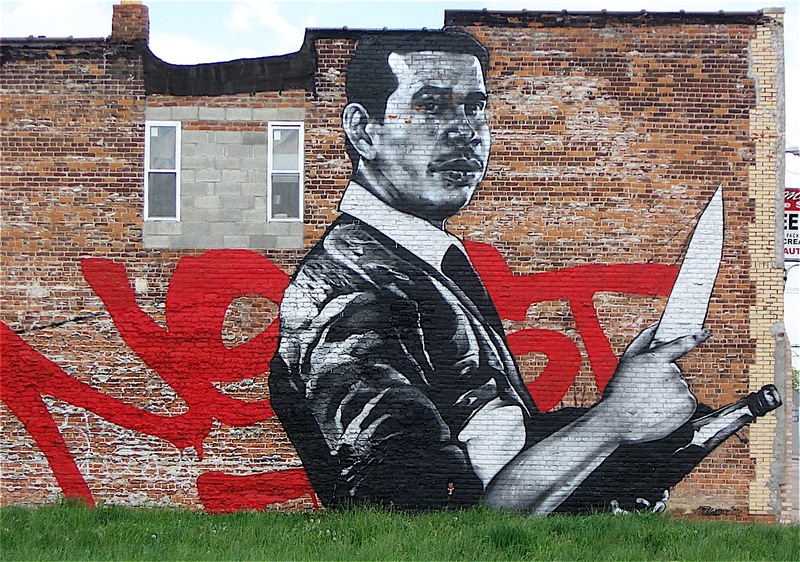 Scattered across the city of Detroit are some amazing graffiti murals. 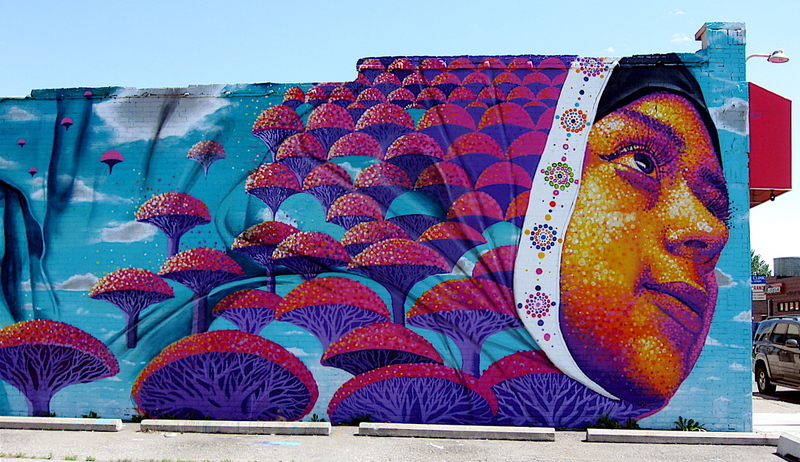 They have been created in multi-colored designs on large walls throughout many of the city’s neighborhoods and commercial districts. 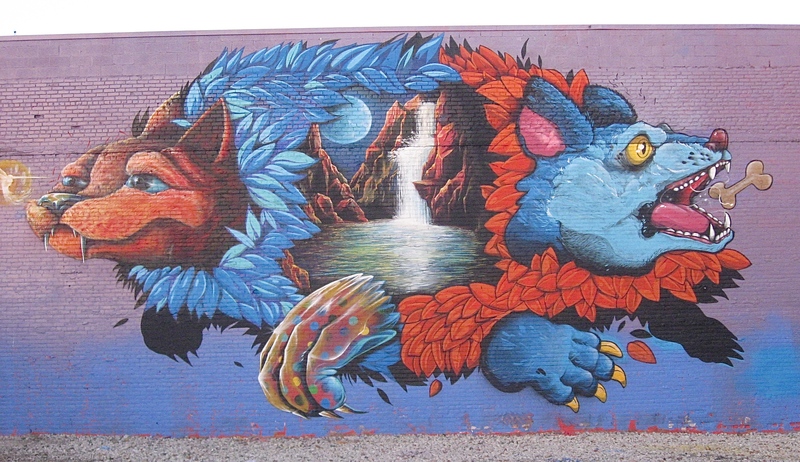 Talented street artists from Detroit, Los Angeles, the Carolina’s, New York City, and other places use nothing more than spray paint from cans to create the giant, colorful murals. 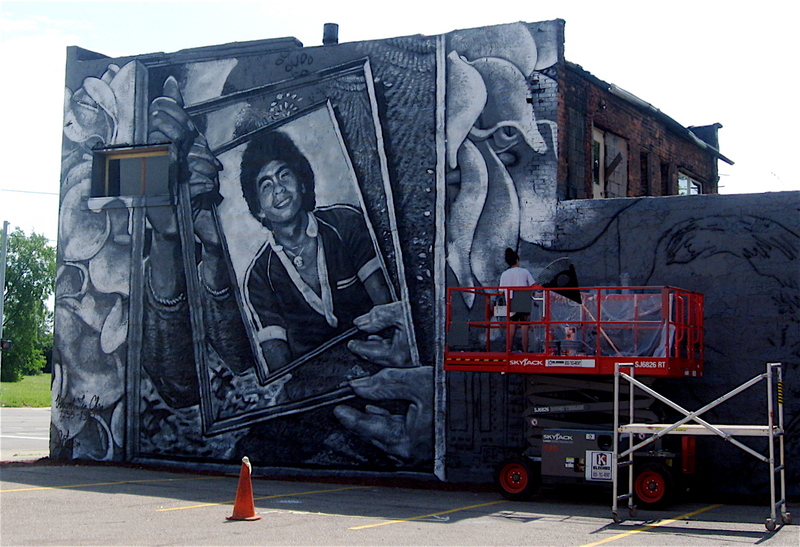 The remarkable works of art are full of detailed imagery and many of the pieces are monumental in scale. 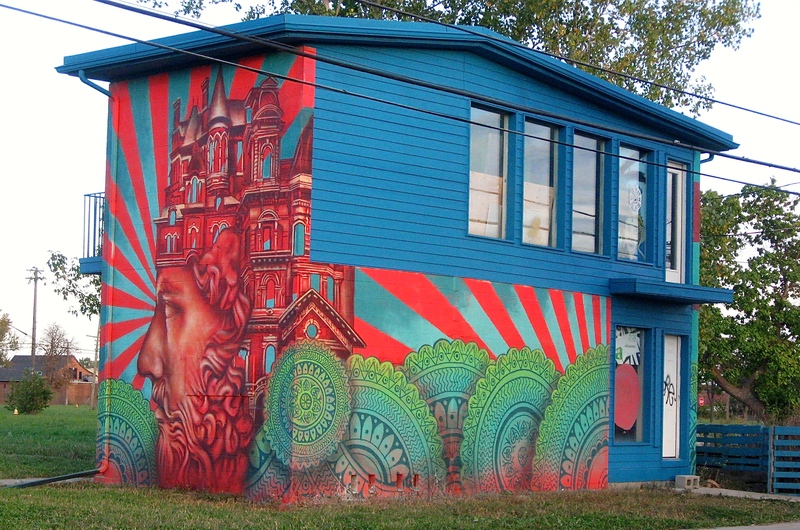 It isn’t unusual to see these beautiful works of art completely covering the sides of two-story buildings. 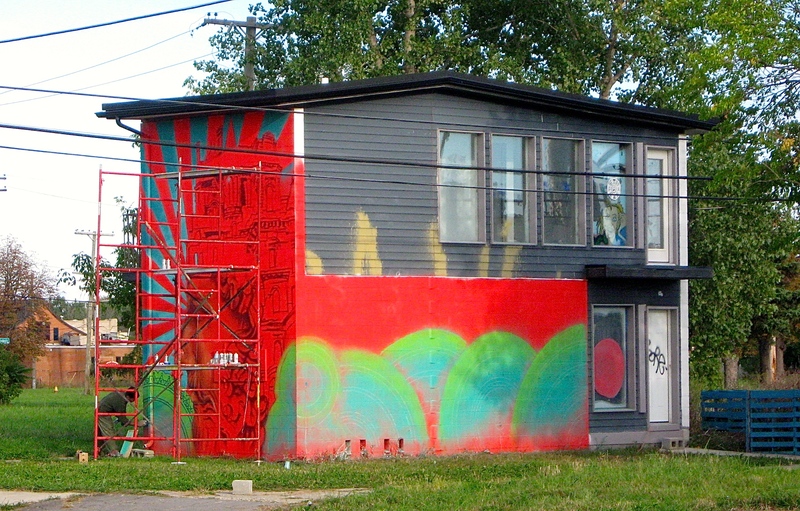 In some cases, the murals don’t last very long on a wall because they are painted over in a relatively short time. 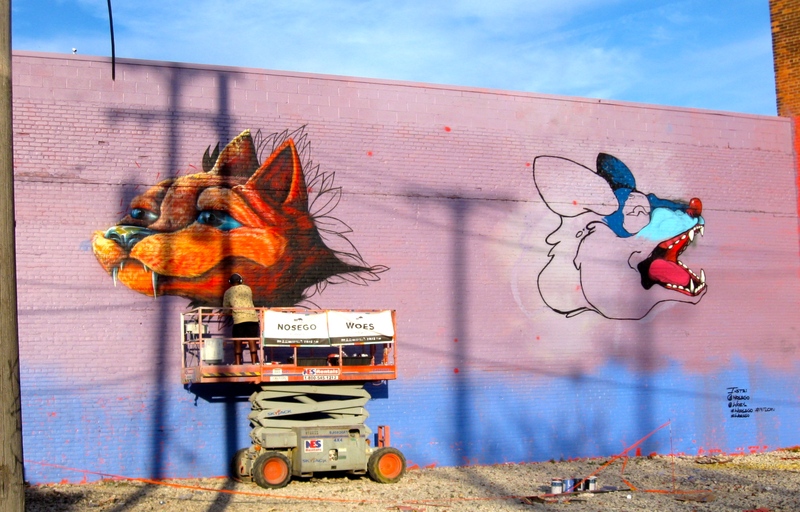 Depending on the site, I’ve seen a fresh piece quickly go up and within a few days, it has been painted over with a new piece of art by the same artist, or in some cases, another painter. 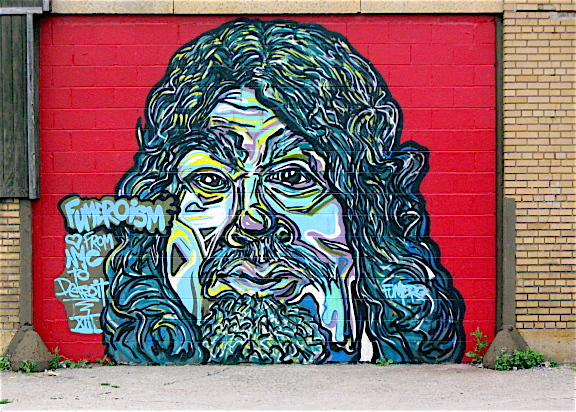 Some of the murals are so fresh and new that I could smell the distinct odor of enamel paint in the air as I rode up to them on my bicycle. 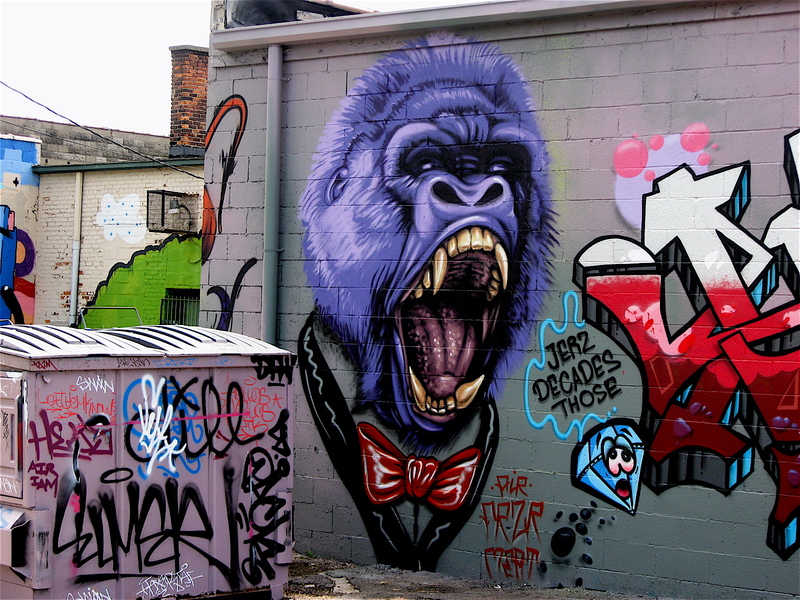 The subject matter of the works of art I’ve seen has a wide array of content. 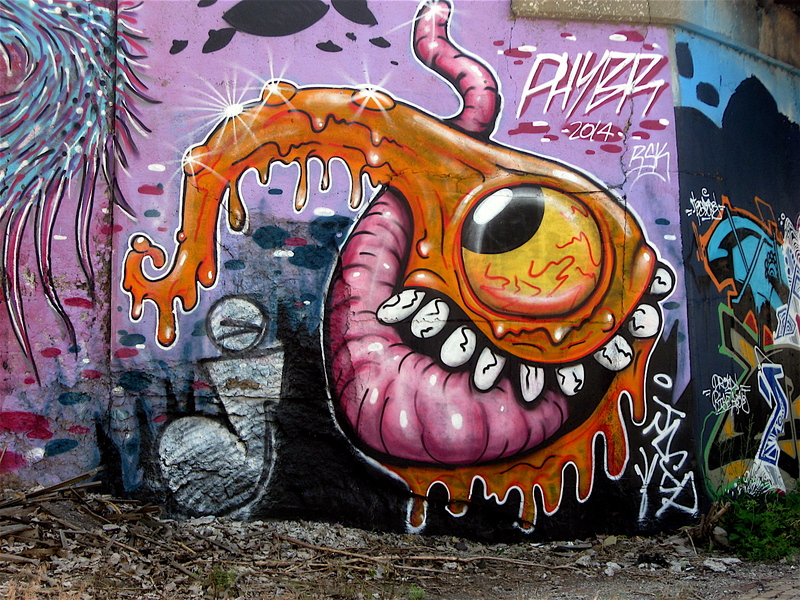 They include portraits, historical figures, monsters, birds, eyeballs, cartoon characters, and plenty of other interesting images. 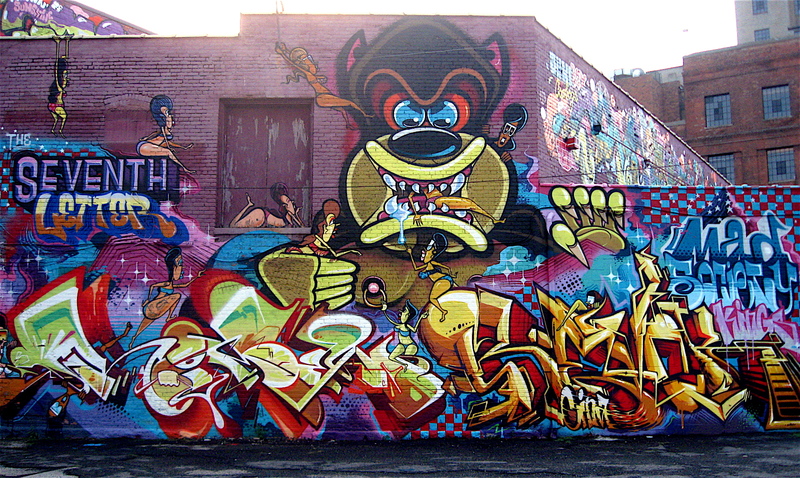 Although there are graffiti murals scattered around the city, there are a few hot spots where much of the wall art can be seen. 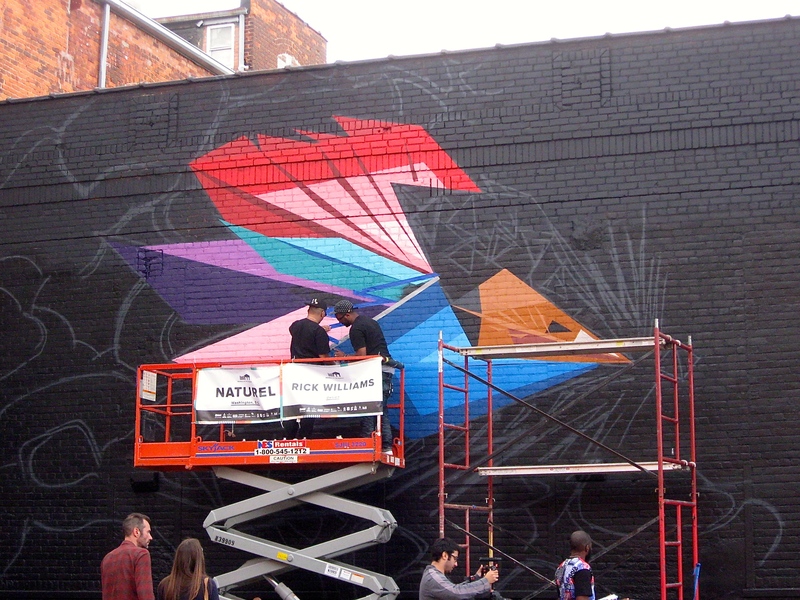 They include the Lincoln Street Art Park, the Grand River Creative Corridor, a railroad wall along Newark Street and other places such as the historic Eastern Market and the Detroit Hispanic Development Corporation building on Trumbull Street. 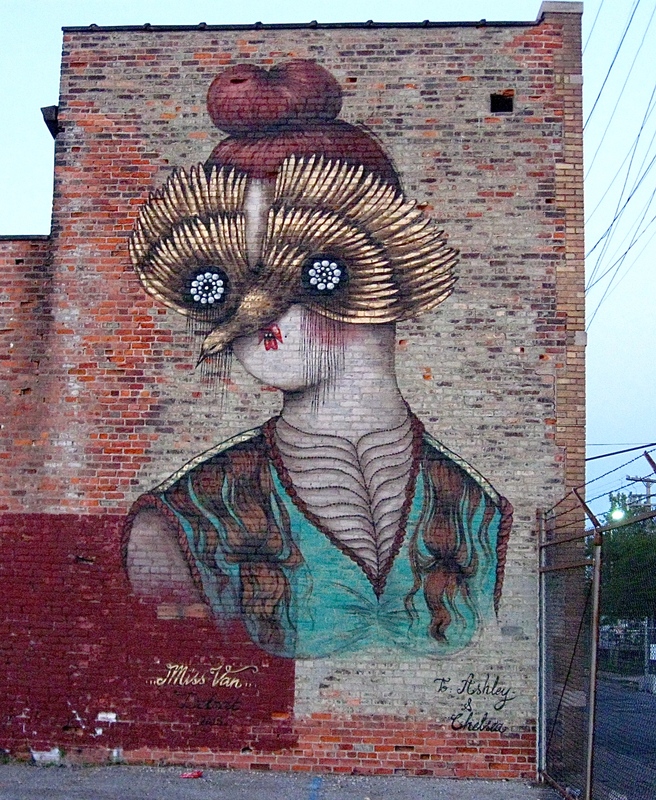 Keep your eyes open, because you never know what you’ll see on a wall in Detroit.